Candi excelled herself by serving up a scrumptious breakfast complete with home-made sourdough. YUM. We packed and got ready for our last day on the road. 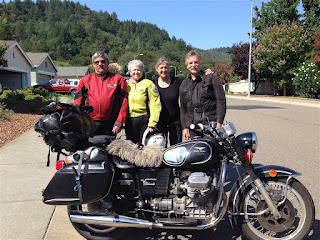 Patrick & Regina on their Guzzi's and David on his Triumph joined us. We waved farewell to Candi and Edward (the dog) and we were on our way. 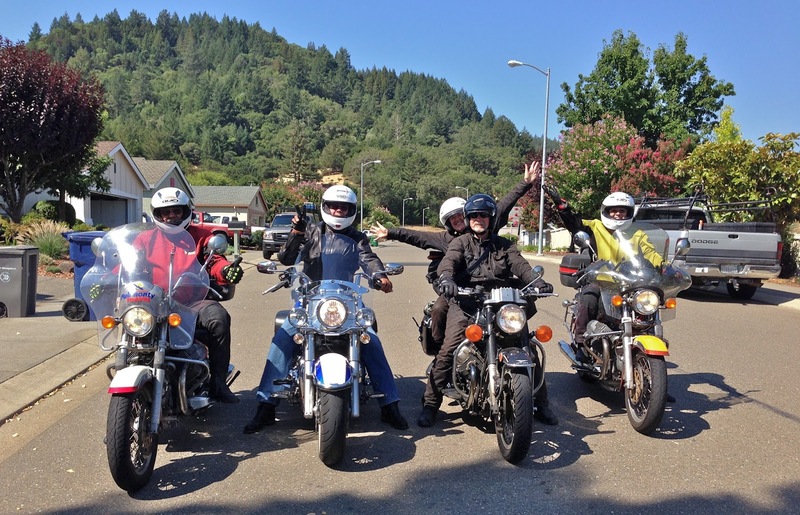 Patrick led the way through the Napa Valley via back roads. There were so many wineries I lost count at 200 million...!!! We observed lots of activity with all wineries in various stages of plantings. It was obvious just how much work goes in to creating a vineyard. We rode through Geyserville to Calistoga and this is where we said our goodbye's to David. Our next short stop was at the SONOMA Raceway. We could hear a car at high speed squeeling it's tyres and sometimes come to a sudden halt. We couldn't see the car but could easily imagine the spin-outs and could tell that it was doing serious race practice. The Raceway was built in 1968 and hosts various categories of racing including NASCAR, Indy and Superbikes. The tell-tale signs were there that we were getting closer to San Francisco. Next stop, San Fran. Words can hardly describe how excited we were to finally see the Golden Gate Bridge. It represented the official end of our journey. Ellie had done it. She's amazing. There was nothing for it than to shoo the tourists out of the way and ride Ellie up on to the footpath so she could have her photo taken in front of the bridge. This was her day. Standing at the look-off and contemplating the various sections of our trip and who we've met along the way was amazing. We could not stop smiling. But, the time came to keep rolling and so we did. Patrick led us over the bridge, around the very expensive area of Pacific Heights, along Ocean Beach, past the Airports, past Facebook Headquarters and along Dunbarton Bridge to Fremont. We couldn't believe how cool it was. All those brochures show-casing a glowing red bridge and blue skies belied what we were experiencing today. Patrick explained to us that when it is super hot inland, the sea mist is drawn in and covers the city in cloud and with that, the cool air. He laughs when he said most tourists get off the plane and the first thing they do is go to the shops to buy a winter coat! Luckily for us Fremont is a much warmer, more pleasant and a very relaxed area to live, more so than the city. Our journey ended at 5.00pm in Patrick & Regina's driveway. We were 'happy' and 'sad' that our journey was over. We looked at Ellie in admiration. She really did do an amazing job. We capped it all off with a celebratory drink and dinner out at Shalimar Indian Restaurant. Patrick & Regina, we can't thank you enough for your efforts in putting the word out amongst the Guzzi community about our planned trip. From that we met so many brilliant people and we will treasure our time spent with them. We count ourselves fortunate to know you and call you our friends. The Moto Guzzi community is lucky to have you on their side.